Pathologists have numerous theories on the best strategies for managing fungicides to avoid resistance. Most discussions of resistance center on dollar spot and pythium. These may not be good models for us because we see very little of these diseases and we don’t have a climate conducive to severe disease pressure every year like other parts of the country where these diseases are major problems. Apply fungicides only when disease is active. Use contact and contact + systemic fungicides. There is no indication that resistant fungi develop under this approach but level of disease control may not be good enough for player demands. The idea here is to use systemic fungicides on a regular, recurring basis regardless of the presence of disease. This strategy is supposed to prevent resistance by reducing initial levels of fungal inoculum, which results in less disease activity and decreased selection pressure of possible mutant strains of the pathogen. Expect great control for one to two years followed by serious disease activity after that. We are not aware of any research that demonstrates this is an effective strategy over the long term. Remember that once resistance occurs you have essentially lost the use of that fungicide. Never apply the same fungicide more than two times in a row. Rotate by using fungicides with different modes of action. This can work pretty well but the tendency is to use a lot of fungicides and you may not get acceptable knockdown activity using only systemic fungicides. This strategy uses a combination of curative, and at times, preventive treatments. Your goal here is to avoid applying fungicides whenever possible. Use a rotation of different modes of action of systemic fungicides alone and mixed with contact fungicides. This approach is outlined below along with notes on use of specific fungicides. People who use this strategy seem to enjoy consistently good disease control. Example: Microdochium Patch fungicide rotation for Poa annua/bentgrass greens where anthracnose is a minor problem. Example: Microdochium Patch fungicide rotation for Poa annua greens where anthracnose is a serious problem. The goal here is to save the products that are strong on anthracnose: Heritage, Banner, & Fungo 50. Use weaker products early or when disease pressure is low. When disease pressure is high, use PCNB or Banner + Fore. When Microdochium is really active, include Fore with all systemic products. When pressure is high, use high-labeled rates of registered fungicides. Use PCNB strategically with the goal of avoiding more than two applications per season. Bayleton, Heritage, and Medallion are weak on Microdochium Patch. Additional Thoughts: If you have a significant problem with anthracnose, think long and hard about relying on Banner Maxx, and thiophanate methyl on Microdochium patch. They are more valuable for anthracnose control than for Microdochium so there is no good reason to waste them on Microdochium unless you have no other options. Fortunately, there are three new fungicides that have activity on anthracnose: Signature, Endorse, and Medallion. Medallion and Daconil together provide excellent control of anthracnose. Signature and Daconil (or 26GT) provide good control, and Endorse and Daconil provide some control but have been less reliable in our trials than the other two combinations. Endorse is an antibiotic that will likely develop resistance problems quickly if overused. Signature has been used for many years on other plants with no resistance developed to date. Consider a tiered system where you start out scouting in fall and avoid treating until disease activity reaches your threshold for acceptable damage. Once disease activity reaches your threshold, make your first application and then continue scouting until disease activity exceeds your threshold. At this point, make sure you apply mixtures of systemic + contact fungicides and lower your threshold so significant damage never occurs. From late fall through early spring, grass won’t recover rapidly so you can’t tolerate damage during this period. As the season winds down in spring, stretch application intervals and raise your threshold again since grass will quickly grow out of minor damage at this time. 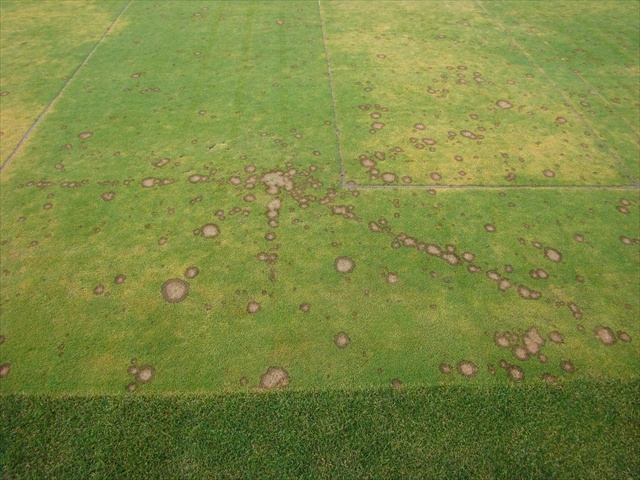 Avoid using programmed or preventive applications for Microdochium Patch. In most situations you can achieve good control with timely curative applications based on careful scouting. Superintendents we work with who use a scout and treat approach seem to have fewer disease problems than those who tend to spray on schedule or preventively for Microdochium Patch. Also, when dealing with Microdochium Patch, fungicide rotations based on a carefully chosen rotation of products have fewer failures than programs based on single products or single modes of action. In general, foliar pathogens can be controlled effectively using curative or curative/preventive fungicide applications. Examples include Microdochium Patch, Yellow Patch, Red Thread, and most leaf spot diseases. Exceptions include the various snow mold diseases, which require snow for the fungus to become active. These can only be treated preventively. Anthracnose can sometimes be controlled on a curative basis but when it causes basal rot it can only be controlled with carefully timed preventive fungicide applications. Root pathogens generally are best controlled with carefully timed preventive fungicide applications. Necrotic Ringspot and Take-All Patch fit this approach fairly well. It is possible to suppress Take-All once symptoms show but in general preventive applications give the best control. The key in deciding whether to use preventive or curative strategies is to make sure you know what you are trying to control. Disease control is definitely not a “one size fits all” situation. Medallion – Contact with a single mode of action, weak on Microdochium Patch in OSU trials, high label rate very good on anthracnose mixed with Daconil. Signature and other Phosphite Fungicides – When mixed with Daconil Ultrex (4.0 + 3.2), good on anthracnose when used in a rotation with Banner, Triton/Trinity or Torque. Torque – 2010 addition: Looks like a promising addition for Anthracnose. There are also many new premixed products. Fungicides are often mixed to increase the spectrum of disease control or mask weaknesses of one of the components. Make sure you study the labels and know what chemicals are in the mix.